Finals Round 2 - the Tiger lid? A super quick preview this week. Can Sydney continue their run? What about West Coast fairytale? Read our ratings to find out! Our top 2 remained unchanged after expected wins last week. Sydney remains our highest rated team but need to win 3 away games from here. Richmond shot up our rankings with their big win - jumping into the top 3 and displacing Geelong, who drop down to 6th. The train is certainly building for the Tiger army, although there is a pretty big gap between Adelaide and Sydney and the remaining teams. Sydney looks a clear favourite here, despite being the away team. 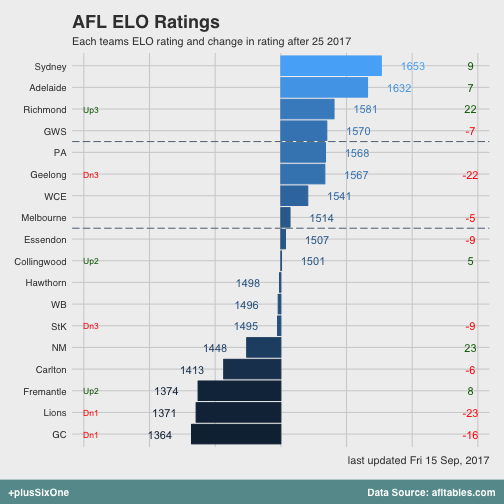 They are pretty clear leaders in our ratings and Geelong have been falling - particularly after last week. Our model is tipping a pretty comfortable win here. For Saturdays matchup, things aren’t as clear. West Coast were unexpected winners last week but come up against at GWS team that has been hovering as a second tier team for most of the season. GWS slight favourites but should be a close one. Adelaide fans can probably start booking their flights if you believe our ratings! 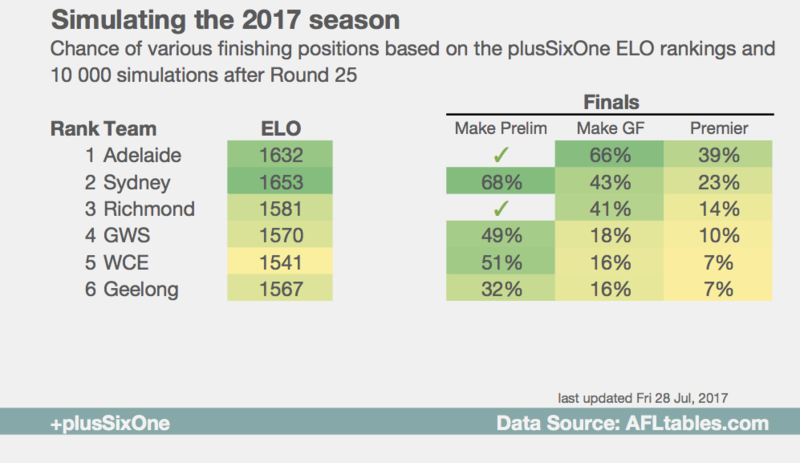 The Crows make the finals in two-thirds of all simulations. They win nearly 40% of all our simulations. 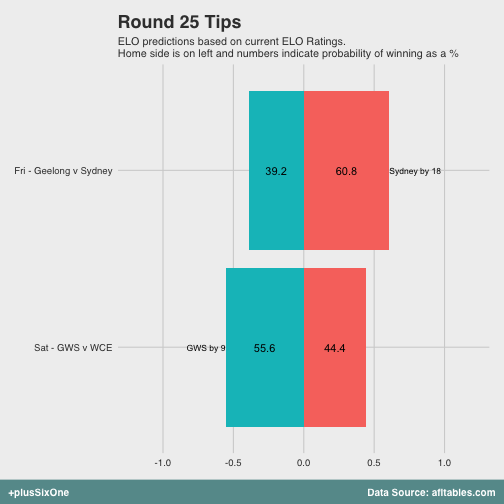 As the highest rated team, Sydney looms as the biggest challenger. Their big risk is that they must win 3 away games from here. Richmond is the next favourite after these guys - hopefully a 14% premiership chance doesn’t equal to a lid blowing off?